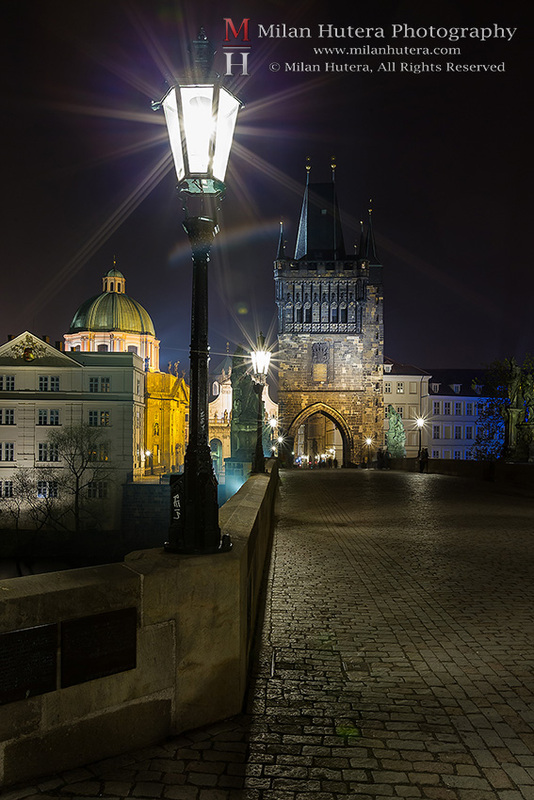 At the begining of April, I spend a day in Prague. It was my second visit to this city full of historical monuments. Unfortunately, both of these trips weren’t focused on photography. Nevertheless, I hoped I’d manage to take at least some photographs in the evening and morning. The key to evening photography in the city is timing. 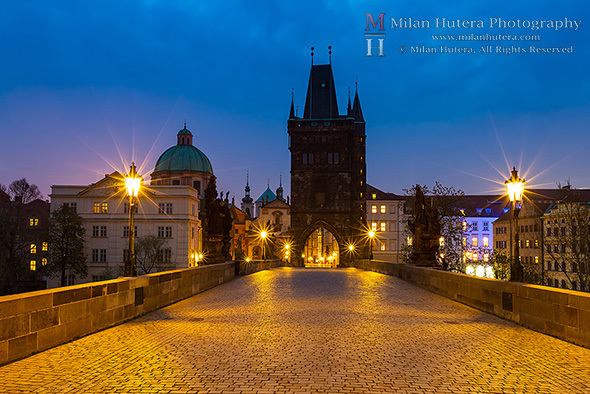 The city monuments must be photographed when the monument’s lights are turned on and there is still some color and light in the evening sky. Unfortunately, the evening shooting turned into nighttime shooting thanks to some hindrances along the way to the Old town. I took my first photo shortly before midninght and the sky was almost completely black. Despite this shortcoming, the photos I took are worth sharing and will serve as references for my future visits. 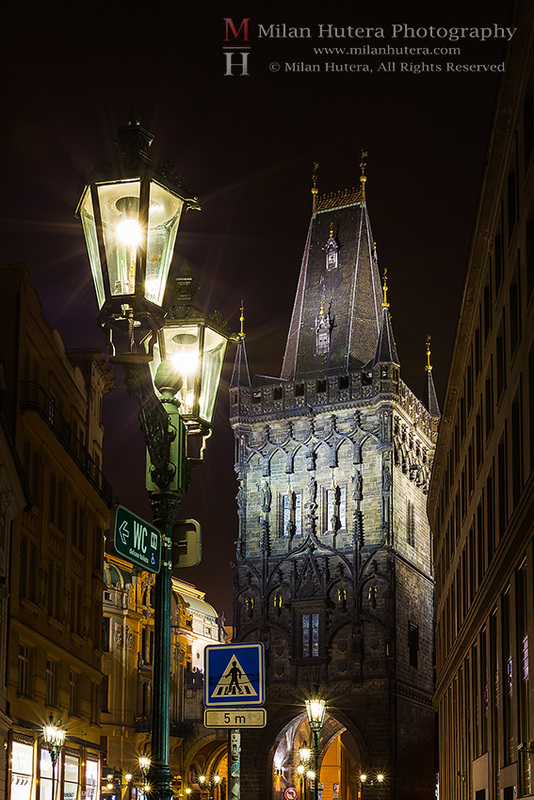 I was also very surprised by the large crowds, that roamed the nighttime Prague on a weeknight. This trip was also a good oportunity to test the Canon 16-35 f2,8 L II ultra-wide lens I purchased a few months prior to this trip. The lens performed very well. It’s known for its fantastic rendition of “star bursts”. This effect naturally occurs, when the light coming from a small source passes through stopped-down lens. Most of the modern lenses have 8 aperture blades, that create 8-point star bursts (as can be seen on the last photo in this post, taken with Canon 24-70 f2,8 L). However, the Canon 16-35 II has 7 aperture blades, that create wonderful 14-point star bursts. The only negative aspect of Canon 16-35 II was the flaring, that can be seen on some photos. One of the many marvels of Prague is the ancient Astronomical Clock, located on the Old town square. I wanted to replicate a photo I saw on some website dedicated to travel photography. 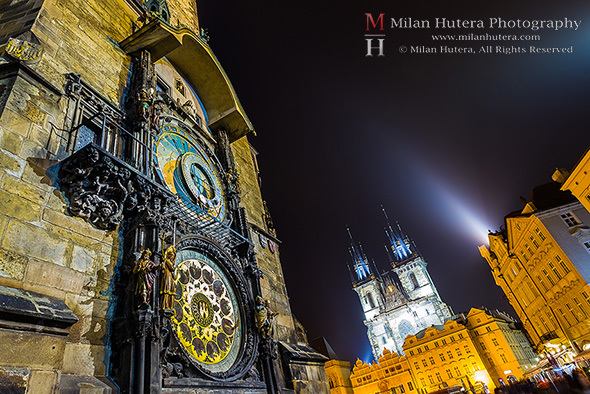 It included the Astronomical Clock and the towers of the Church of Týn in the background. While the angle is slightly different and the buildings are “collapsing”, the ultra-wide perspective created my favorite photo from this short trip. 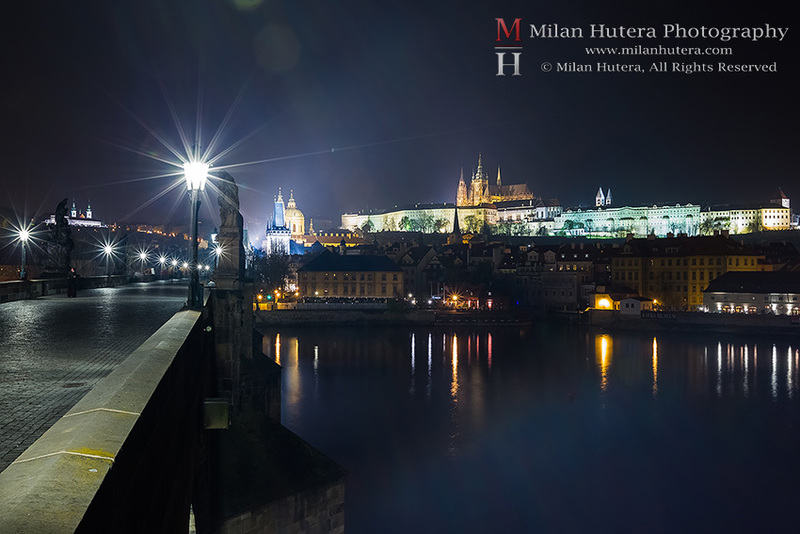 Beautifully lit Prague Castle after midnight, as seen from the Charles’ Bridge. The lights of Charles’ Bridge and the Old Town Bridge Tower. The Powder gate is one of the original Gothic towers of Prague’s Old town and it’s located within short walking distance from the Old town square. It was used to store the gunpowder, hence the name. Two towers of Charles’ Bridge, located on Mala Strana with the Saint Vitus Cathedral and Prague castle in the distance. 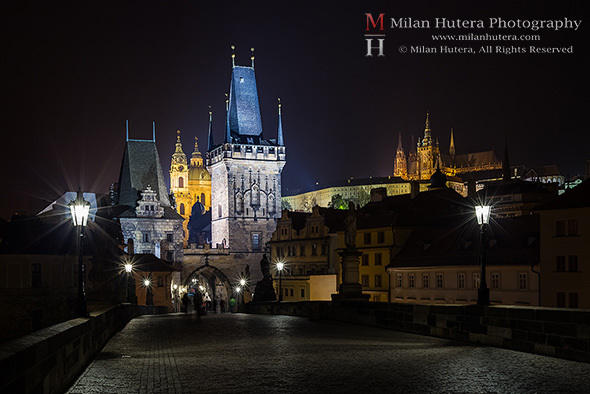 Two towers of Charles’ Bridge and two of the many statues placed among the bridge. 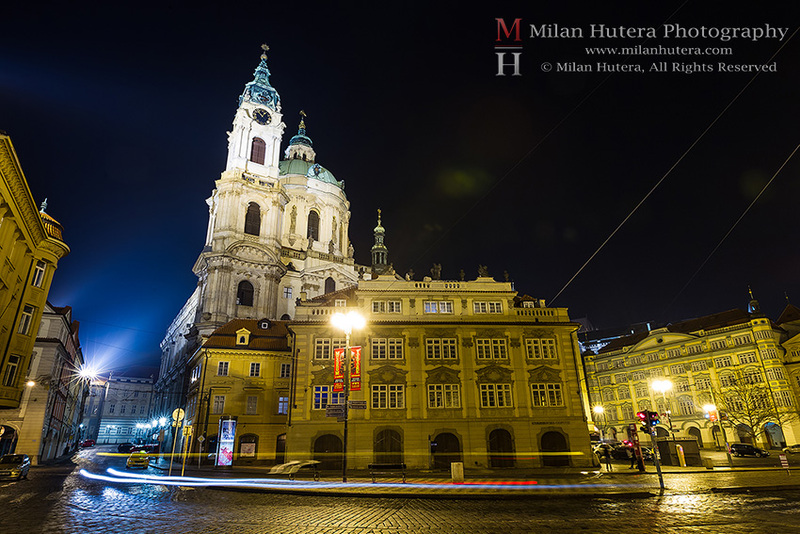 The church of Saint Nicolaus is located within short walking distance from Charles’ Bridge. The buildings are “collapsing” due to uncorrected ultra-wide perspective. The streaks of light on the road were caused by passing taxi cab during the long exposure. 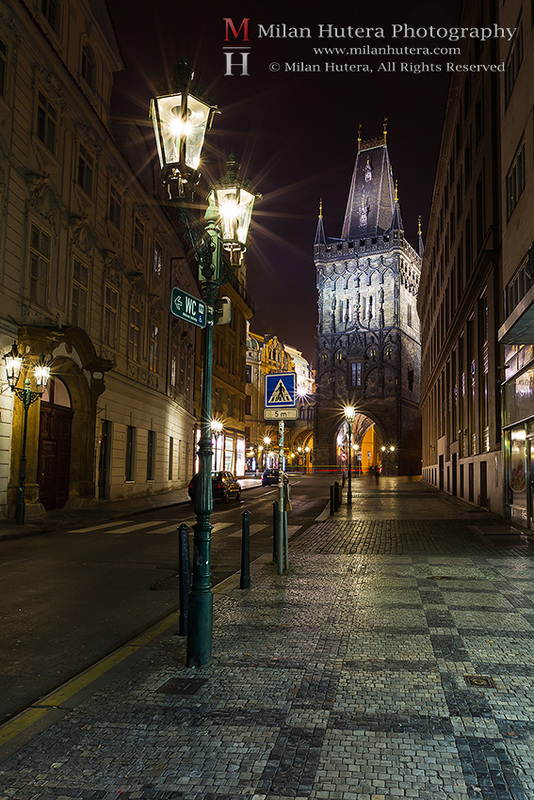 I returned to Charles’ Bridge only a few hours after I took the photo of the Church of Saint Nicolaus. Unfortunately, the morning was gloomy and didn’t provide any spectacular morning colors. 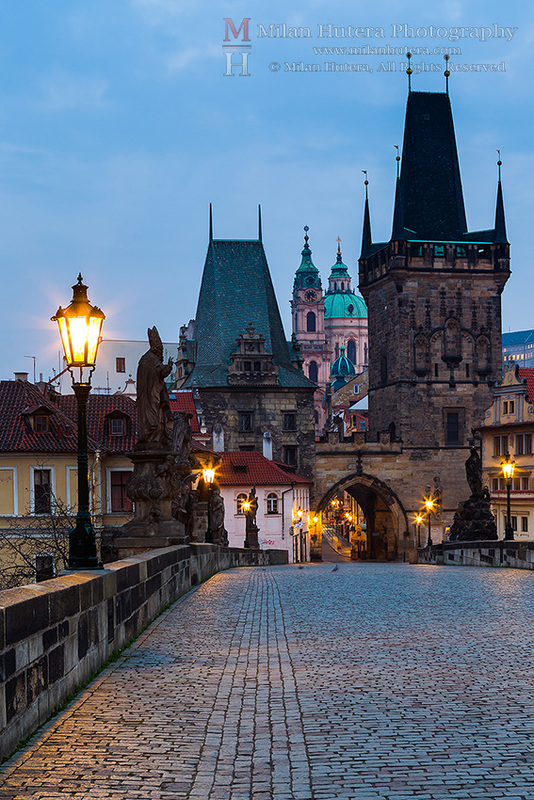 I’m already looking forward to my next visit to Prague. Hopefully I’ll be able to spend much more time doing photography.